HILLSBORO, Ore.--(BUSINESS WIRE)--SureID, Inc., the leading provider of high-assurance identity solutions, is taking its military-trusted universal identity solution to the coaching and volunteering community. According to the U.S. Department of Labor, 62 million volunteers and three million coaches serve vulnerable populations such as children, the elderly, people with disabilities and underserved communities in the United States. Malicious actors often go unchecked. Register: Coaches and volunteers can pre-register online, and complete the process at a SureID Registration Station at select retail locations across the United States. Personal information need only be provided once and SureID keeps it secure. 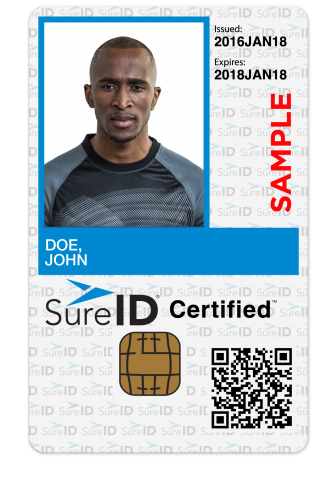 Prove Identity: SureID combines its patented technology with biometrics, biographics, and in-person identity proofing to deliver its unique service. Screen: Facilitated through the consumer, SureID integrates certified background screenings based on key criteria and other factors. Credential: Upon approval, coaches and volunteers will receive a tamper-resistant identity credential via mail. Validate: Coaches and volunteers can have their SureID digital identity authenticated via the SureID Certified mobile app available for iOS or Android devices. 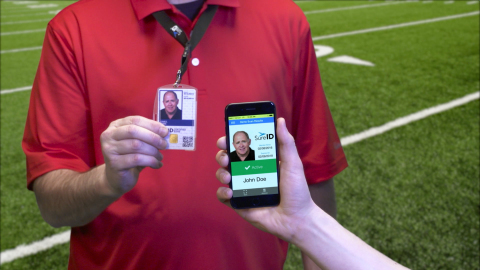 With a quick scan of the unique QR code printed on the identity credential via the mobile app, the app will instantly confirm that the coach or volunteer is active and will display the coach’s or volunteer’s photo. Coaches and volunteers pay a one-time introductory rate of only $19.95, with recurring services of $4.95 per month. To register, visit http://sure.id/signup. The SureID Certified Edge solution has instituted rollouts of its new SureID Registration Stations at select retail locations in seven markets on the West Coast. Thousands of additional new stations soon will be available at convenient locations across the country, creating the nation’s largest identity certification network. SureID, Inc. (www.SureID.com) is the market leader in high-assurance identity solutions. The company creates end-to-end trusted identity programs offering full credential lifecycle management through the combination of registration, identity proofing, background screening, credentialing and identity authentication for government, private enterprise and individuals including contractors, vendors and other authorized personnel. SureID, Inc.’s RAPIDGate® program provides an enterprise-wide, single-credential high-assurance identity for the U.S. Navy, Marine Corps, Coast Guard and Army and the critical infrastructure sector across the country. SureID is the foremost issuer of PIV-I credentials. Founded in November 2001, SureID is headquartered in Hillsboro, Ore., with offices in Minot, N.D., and Alexandria, Va.
SureID, Inc., the leading provider of high-assurance identity solutions, is taking its military-trusted universal identity solution to the coaching and volunteering community.